Protecting one's privacy is a challenge nowadays particularly due to increased number of websites that track user data. Because of the increased privacy concerns, Apple has introduced several Safari privacy features with the introduction of new iOS 12 on WWDC 2018. The new Safari protection features are designed to protect users' privacy as well as enhance browsing experience. Part 1. What's New in Safari Privacy Protection on iOS 12? 1: When Will Your Privacy Be Tracked? 2: Which Kind of Data Can Track Your Privacy? Part 3. What Can We Do to Protect Our Privacy before Updating to iOS 12? What's New in Safari Privacy Protection on iOS 12? iOS 12 is taking privacy further with the introduction of new, enhanced Safari privacy protection features. Safari will now prevent common widgets and Share buttons on web pages from tracking you. Furthermore, the iconic web browser from Apple will also prevent advertisers from collecting your iDevice's unique characteristics, which means that they cannot identify your device or retarget any ads to you across the web. Apart from the Share button, Safari browser will also automatically prevent Like media buttons and comment fields from tracking users until they are interacted with. This a powerful new privacy feature that will not only be available on iOS 12, but also on macOS Mojave. If you interact with Share or Like buttons on any web page, Safari will show you an alert warning you that you may be tracked by performing this action. Apart from this, some new security measures will also be implemented to prevent digital fingerprinting or the use of things such as installed plugins and fonts to help track users even with privacy settings active. New password organizing features will also be included in Safari that will automatically create and store passwords as well as flag reused passwords between websites so they can be changed. As mentioned above, protecting your privacy is a challenge nowadays. Many websites use different measures to track your device with iOS 11 and earlier versions quite easily. This can be a huge privacy risk because if that data is misused, the consequences will be severe. When Will Your Privacy Be Tracked? Most of the problems occur when you use your web browser to browse a website that contains ads, Like and Share buttons, discussion forums, stock quotes, etc. This is because a lot of the crackdown focuses on third-party software that is delivered to you with the rest of the website when you browse it. Which Kind of Data Can Track Your Privacy? Cookies are text files that third-party tools and the website publisher itself can store on your web browser in order to track you. While cookies are handy for different situations such as alerting the website that you are logged in when you revisit it after a day or two, it also provides a way to track your data. To enhance user privacy, Apple implemented the intelligent tracking protection last year on third-party cookies. This year, the privacy is further improved via the introduction of intelligent tracking protection 2.0. So, What Can We Do to Protect Our Privacy before Updating to iOS 12? Deleting your Safari's data is one of the quickest and the most reliable ways to prevent privacy leak. However, deleting your Safari's cache, cookies, etc. from your iDevice via ordinary method is not recommended because the data is not removed permanently. You need to delete such sensitive data permanently. iMyFone Umate Pro is an iDevice data erasing software that will help you do that. What Can iMyFone Umate Pro Do with Safari's Data? Scan all Safari's data including history, cache, cookies, etc. and erase it permanently. 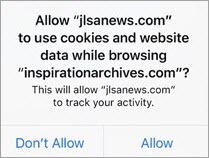 Scan for Safari's browsing history that you have already deleted (which can be easily tracked/recovered) and permanently erase it to protect your privacy. How iMyFone Umate Pro Permanently Erases Safari Data? 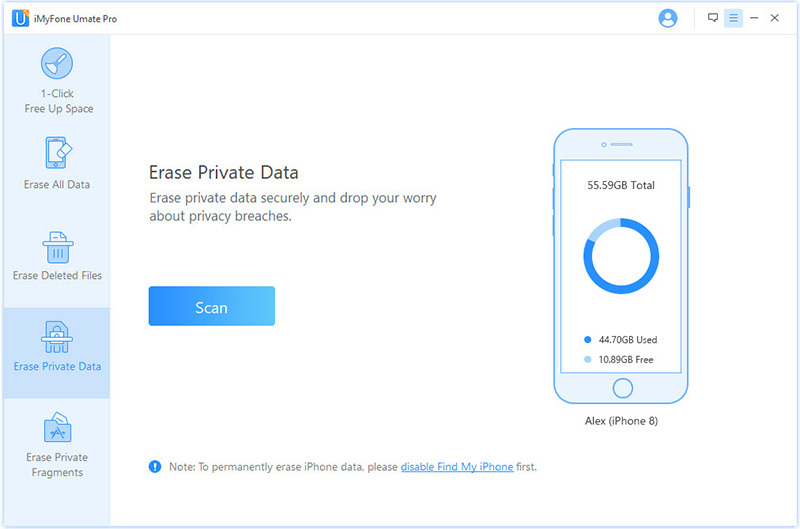 iMyFone Umate Pro removes the original Safari data (history, cache, cookies) in your device including the ones you have already deleted. Once the process of erasure is complete, Umate Pro will store random data on your device storage to overwrite deleted data. Then it deletes the files and refills data again until recovery becomes impossible. After such intricate removal process, even the FBI cannot recover your data from the device. First, you need to download and install iMyFone Umate Pro at your Windows or Mac computer. Step 1. Open iMyFone Umate Pro on your computer.Connect your iDevice (iPhone/iPad) to your computer via compatible USB cable. Step 2. Select on Erase Private Data tab of Umate Pro. Then click the scan button. It will scan all the Safari data (history, cache, cookies) in your device. Step 3. From the scan results, select Safari's data e.g. cache, cookies, history, etc. and click Erase Now button to proceed. Permanently erase all data from iDevice (complete reset) with a single click. So you can have the peace of mind that no one will be able to recover your private data after you sell your device. Scan for deleted files on your iDevice and permanently erase them to make them 100% unrecoverable. 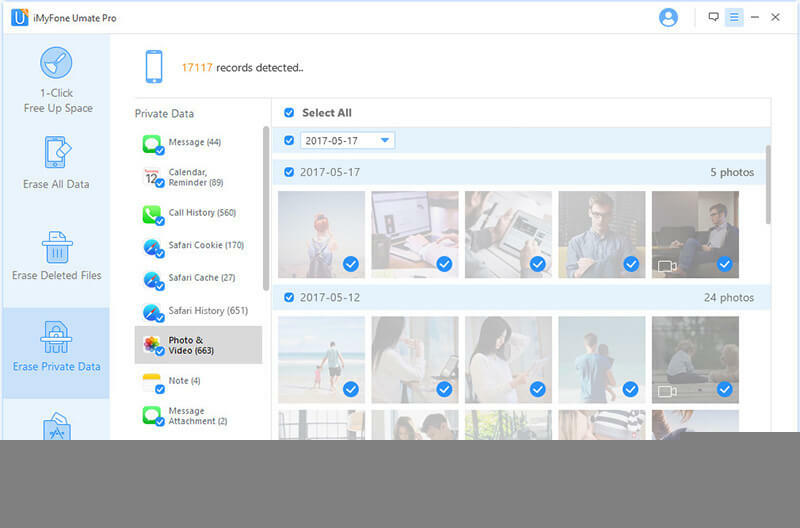 Allow you to erase your personal data separately, including message, call history, photos, videos, notes and 10+ more. Wipe third-party apps' data permanently: Whatsapp, Kik, Viber, Facebook, Snapchat and 10 more. Allow you to preview files and erase them selectively.